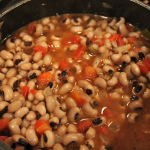 In the Southern states we are serious about traditions and eating black-eyed peas, cabbage (or greens) and cornbread on News Year’s day is a custom we gladly celebrate! 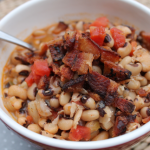 We love giving a fresh twist to classics and we are crazy about this spicy black-eyed pea dish from the lovely Paula Deen. 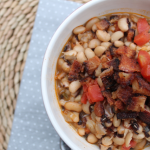 Try it out and let us know if these aren’t the best black-eyed peas you’ve ever tasted! 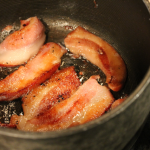 The only thing we do a little different is to use hog jowl instead of bacon and substitute a spicy instead of mild Rotel. If you’ve never eaten hog jowl you really must give it a try. Slice it thin and cook it just like bacon. I find it to be sweeter and less salty than traditional bacon. 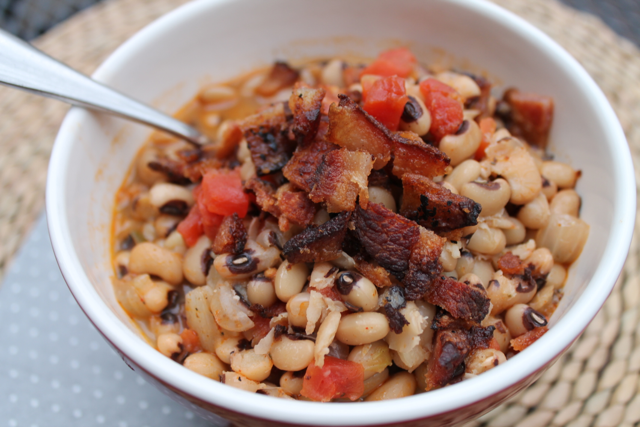 Hog jowl has a great flavor and its a good choice to season any Southern vegetable dish. 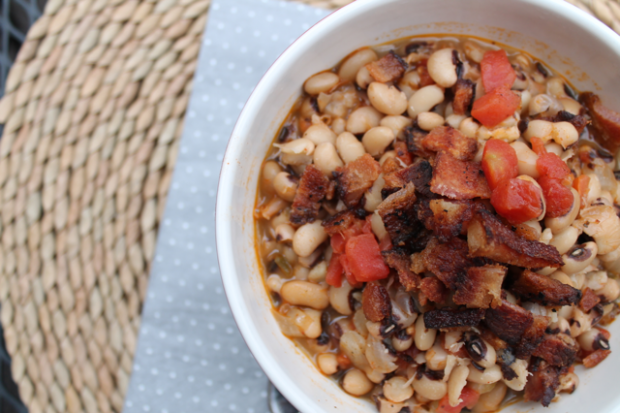 Hoppin’ John is a deep Southern variation of this dish that serves black-eyed peas over rice. 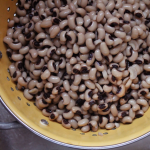 So rice or no rice, it’s up to you – but make sure to start the New Year off right and have black-eyed peas for your dinner. 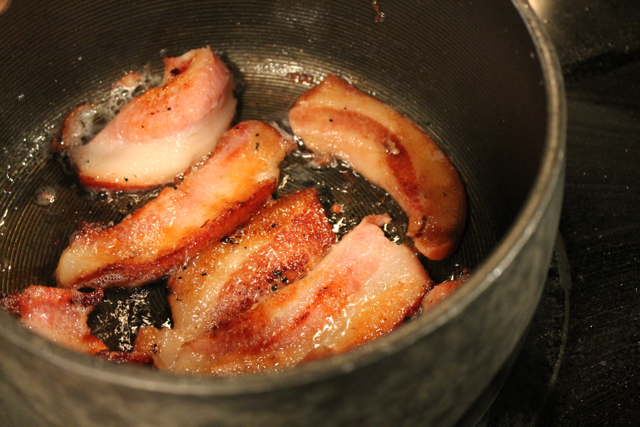 In a large pot, cook bacon until cripsy. Remove bacon, crumble and save for topping the peas. 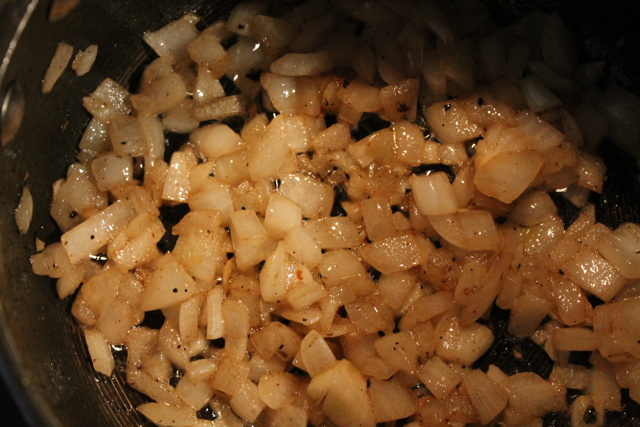 Saute onion in the bacon drippings until tender and translucent. Pour rinsed (but not soaked) peas into pot, then add Rotel, salt, chili powder, pepper and water. Cover and cook the peas for 1 hour over medium heat until peas are tender. Top with bacon and enjoy! 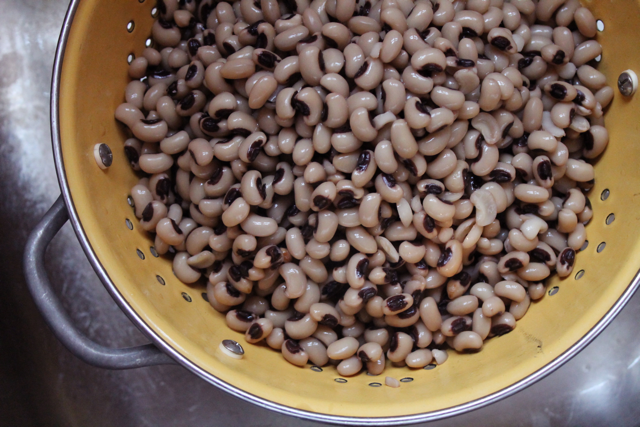 Black-eyed peas are lentils and so they don’t need to be soaked overnight or for long periods of time before cooking. Rinse them well and then toss them in the pot! I just found your site and I love it. 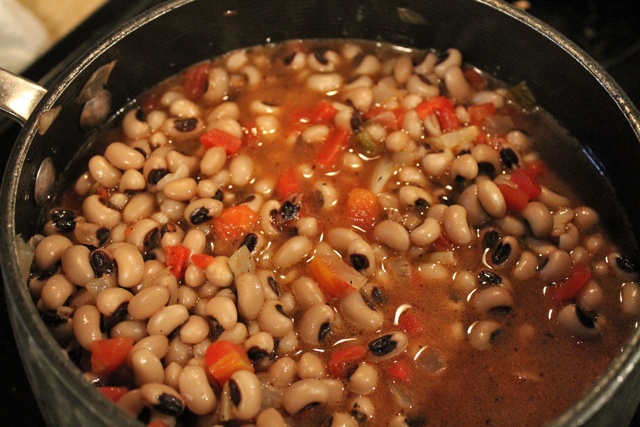 I wanted to let you know that I make the same Hoppin’ John, we all make it a little different but with the same idea :) I omit the chili powder and add 1/2 teaspoon minced garlic, 1/2 teaspoon each of onion powder, garlic powder, Italian seasonings, 1/4 teaspoon ground coriander and 1/8 teaspoon of black pepper, and 1/2 each of chopped green and yellow pepper and few shakes of Texas Pete. 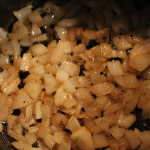 I serve this along side fresh collards (without stems) cooked in crockpot with smoked hog jowl, chopped onion, minced garlic, salt and pepper to taste and Texas Pete for the pepper flavor, heat and vinegar. Slightly sweet buttermilk cornbread, whipped sweet potato soufflé with toasted pecans and marshmallows and sweet iced tea.